To counteract all the cheese-binges and nights out, the only food I’m really preparing at the moment (aside from muesli – latest combination = almonds, cranberries, coconut & dates) is salads. This week we’ve unearthed a couple of real winners from the stack of old Martha Stewart magazines lying around the apartment. Much as it galls me to put sugar into a salad dressing, Martha usually turns out to be right. Which also galls me. Anyway. 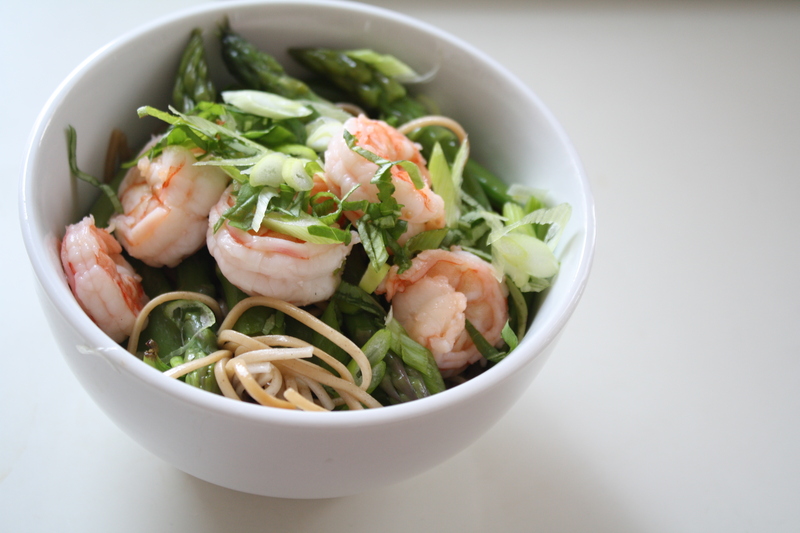 The soba salad looks just as good today as it did when first made last night – we stored the dressed noodles in a separate container to the prawns and veg. I took this shot right before devouring the leftovers for my post-yoga lunch! Bring a large pot of salted water to the boil. Snap off the woody ends of the asparagus & add the spears to the pot for about 3 minutes. You want them tender and bright green, but still with some bite. Plunge the cooked spears straight into some cold water, or run cold water over them in a colander. This will stop the cooking so they keep their colour and texture. Return water to the boil, add the prawns and cook until they’re pink and opaque. Should only take about 2 minutes. Remove from the water and put the cooked prawns in a bowl with the asparagus. Return water to the boil, add the soba noodles and cook according to their packet instructions. Usually about 4 minutes. Drain them, rinse under cold water and drain again. Whisk together the soy sauce, oil, vinegar and sugar in a small bowl. To assemble: Divide the soba noodles among 4 bowls. Drizzle with dressing, top with asparagus and prawns, then sprinkle scallions and basil over the top. It won’t seem like much dressing but it goes a long way, and once it’s all tossed together it’s tasty and light. A great summer dinner. In a decent sized bowl, stir together the poppy seeds, vinegar, sugar and oil. 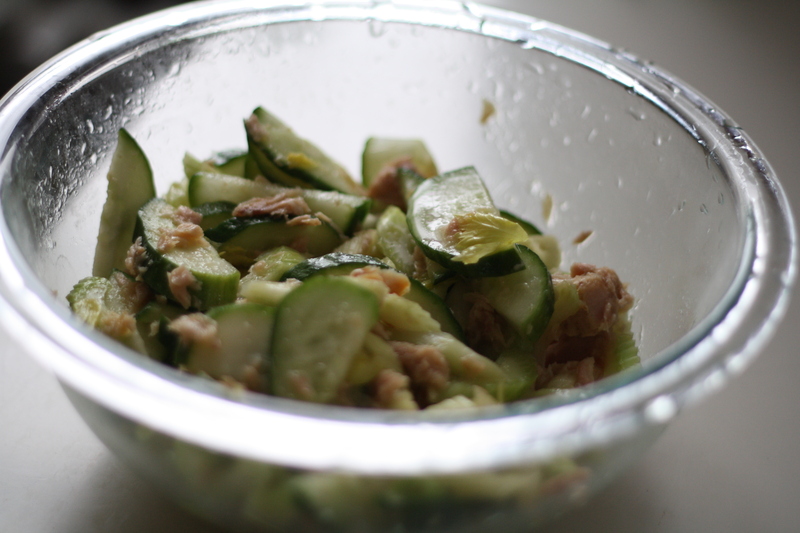 Add cucumber, celery & tuna; season with salt & pepper and toss all together so it’s coated with dressing. Serve immediately, topped with a sprinkling of celery leaves and maybe some fresh parsley or cilantro. 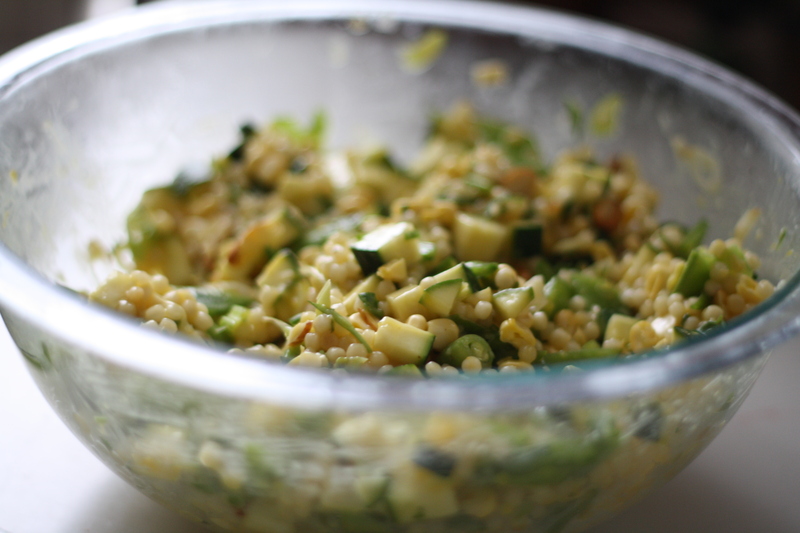 I also reincarnated the pearl couscous salad with sliced snow peas, sugar snaps, diced zucchini and corn kernels (all raw). It makes for a beautifully summery bowl of greens and golds. Don’t forget a handful of chopped almonds for crunchy texture!